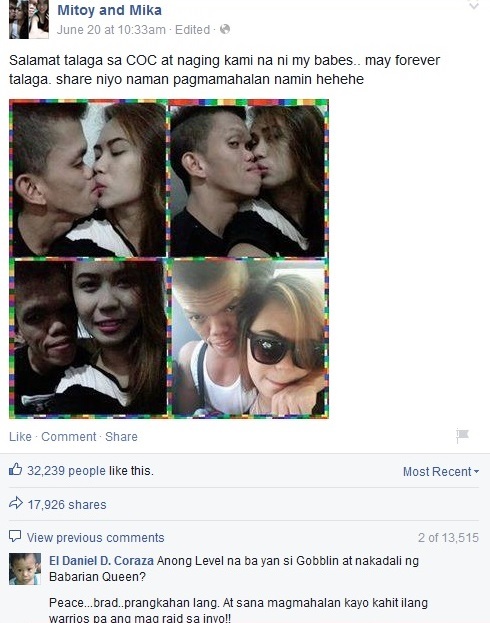 MUST READ: The Real Story behind a Couple Who Fell in Love thru Clash of Clans Revealed! Clash of Clans (COC) is an online game that has been very famous being played by different people around the world, regardless of age, gender and status. This can be played also through teamwork, meaning there are clans created in the game that is open to everyone and expect to meet new people. But, can you imagine that in this game, you can actually find your beloved one? Thanks to COC because Mitoy and Mika found each other. They first started as clan mates, and eventually become couples. After two years of playing the said game, they decided to 'upgrade' or 'level-up' their relationship from clan mates into partner in real life. Their love story has become trending online as they posted pictures showing their gratitude to the creators of COC. Most of the netizens' opinions were not that good, they just did not care because what's important for now is that they are happy to be in love with each other. What can you say about this story? Is it real or not? You may share your kind thoughts below by posting a comment/s.